Comet ISON blazes through the night sky on its dangerous journey toward the sun in this great photo recently sent to SPACE.com. Astrophotographer Adam Block captured this amazing image of the comet using a SBIG STX16803 CCD camera with a 32-inch Schulman Telescope Schulman Telescope atop Mount Lemmon from the University of Arizona’s SkyCenter on the morning of Oct. 8. 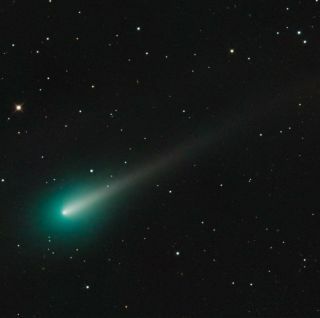 Comet ISON could wow stargazers this December if it survives its close encounter with the sun next month. The comet was discovered last year by a couple of amateur Russian astronomers as it made its way from the cold and distant comet refractory called the Oort Cloud. Astronomers believe this trip is its maiden voyage to the inner solar system. Comet ISON will make its closest approach to the sun on Nov. 28, coming within 730,000 miles (1.2 million kilometers) of the solar surface. Recent photos of Comet ISON by the Hubble Space Telescope showed that the comet has held together during its trip into the inner solar system.